ID Media Coffee - How to Make Your Digital Content STAND OUT! How to Make Your Digital Content STAND OUT! The digital wave has revolutionized many industries including hospitality and tourism. It is not surprising then, that many public relations professionals and marketers have adopted advanced digital marketing knowledge and strategy to engage their target audience. The challenge, however, is how to keep up with the latest market trends - highly influenced by the constant changes in travelers’ behavior; and how to leverage your brand stories to make them stand out among competitors. Cara Membuat Konten Digital Anda STAND OUT! Tren digital telah merevolusi berbagai industri termasuk industri perhotelan dan pariwisata. Maka tidak mengherankan apabila kini banyak ahli di bidang humas dan pemasaran yang sudah memiliki pemahaman digital marketing yang menyeluruh serta strategi untuk menjangkau target audiens mereka. Namun, tantangannya adalah bagaimana cara untuk tetap mengikuti tren pasar terbaru yang sangat dipengaruhi oleh perubahan dalam perilaku wisatawan serta bagaimana cara untuk membuat cerita dari brand Anda agar lebih STAND OUT diantara kompetitor lain. 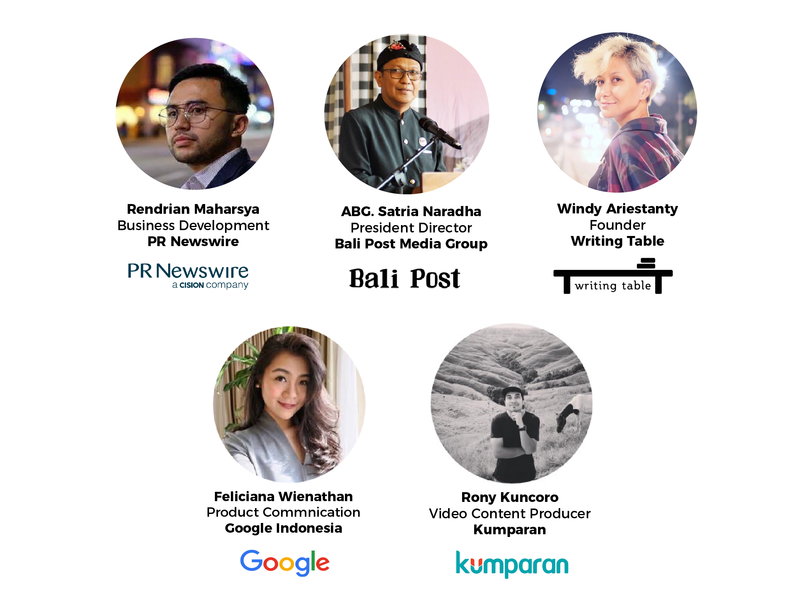 Started off his career as a news reporter for one of the national TV stations, TRANS|7, Rendrian Maharsya is currently serving as Business Development Manager of PR Newswire Asia, Indonesia for more than two years. The Master of Arts (MA) holder of the International University of Japan has spent most of his professional life writing and delivering news from both the media and company's point of view. Well-known as a published writer and professional editor, with more than 10 years of experience as Editor in Chief and Director of Gagas Media Group, Windy decided to jump into creative communications for the publishing industry in 2015. At the moment, apart from traveling and facilitating creative writing workshops, Windy (and her friends) run WritingTable, a pop-up creative writing school fuelled by some of Indonesia’s young writers. Windy is also an independent consultant for brand stories and digital creative communication. Rony Kuncoro is currently a video producer for Kumparan. Previously, he was a documentary film enthusiast and a photographer in Yogyakarta. Then, he became active as a videographer in one of the national television in Indonesia for seven years and his works were mostly focus on traveling, feature magazines, and documentary. Before joining Kumparan, his daily activities were in kompas.id as a content creator. Feliciana Wienathan is a Communications Manager for Google Indonesia where she leads all communication for consumer products and social. Previously, she was a Social Marketing Strategist for Maker Lab @ Google, where she has worked on various marketing campaigns for Google Search, YouTube, and YouTube Go - as well as Google Indonesia’s corporate initiatives including Gapura Digital, Womenwill, and Google For Indonesia. Her work for Google Indonesia has received multiple awards and recognition, both nationally and regionally. wice a year, our Media Coffee sessions now run in 6 markets including Taiwan, Hong Kong, Singapore, Indonesia, Vietnam, Malaysia, and will continue to expand to cities like Sydney and Seoul later this year. To learn more about Media Coffee, please visit here.